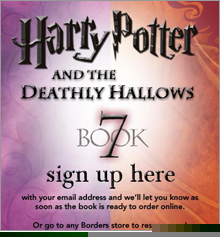 Scholastic to release the seventh book in widely popular series; will be in bookstores a week after the fifth movie. NEW YORK (CNNMoney.com) -- The final Harry Potter book will hit bookstores July 21, its publishers announced early Thursday. "Harry Potter and the Deathly Hallows," by J.K. Rowling, will be the seventh and final book in the best-selling children's book series of all time. Scholastic (Charts), the series' U.S. publisher, said the previous book, "Harry Potter and the Half-Blood Prince" was the fastest-selling book in U.S. history, selling 6.9 million copies in the United States in the first 24 hours. The final Harry Potter book will be available July 21. British publisher Bloomsbury Publishing, which has the ultimate rights to the book that it franchises around the world, said the book sold just over 2 million copies in the United Kingdom in the first 24 hours. Interest in the final book could be heightened by comments from Rowling suggesting that Harry Potter might not survive the final book. Some major characters have been killed in earlier works. Overall the series has sold 325 million copies worldwide and been translated into 64 languages since its initial publication in 1997, according to Bloomsbury's statement. Bloomsbury said the audio book version of the new book, read by Stephen Fry, will be released simultaneously with the print edition for the first time. The book will cost $34.99 for the U.S. hardcover edition and be printed under the Arthur A. Levine imprint of Scholastic. (That's translates into 7 galleons, 4 sickles and 11 knuts in the currency referred to in the book). Book retailers Barnes & Noble (Charts) and Amazon.com (Charts) both started taking orders for the books early Thursday. The book also comes out a week after the July 13 release date of the fifth movie, "Harry Potter and the Order of the Phoenix" from Time Warner (Charts) unit Warner Bros. Time Warner is the parent of CNNMoney.com. The first four Harry Potter movies have done worldwide box office of $3.5 billion, according to BoxOfficeMojo.com. The most recent film, 2005's "Harry Potter and the Goblet of Fire," did worldwide box office of $892 million, making it the second-best grossing film in the series, behind only the first in the series, "Harry Potter and the Sorcerer's Stone," which did $976 million after its 2001 release. The sixth movie in the series, "Harry Potter and the Half Blood Prince" tentatively has been given a Nov. 21, 2008 release date.